The excitement was palpable as the Sam Houston Math, Science and Technology Center Mariachi Band began to perform on Friday, formally kicking off the celebration designed to mark the start of construction on their new school. Blustery winds didn’t stop dozens of students, teachers, parents, and alumni from gathering in the school parking lot to witness the ceremonial groundbreaking for the new Sam Houston — part of the 2012 Bond Program — and catch a peek of the construction that already is underway. “I believe strongly that our students deserve a state-of-the-art school,” Sam Houston Principal Alan Summers said. “Not only because they deserve to go to a school that looks good, but also because they deserve to be in a building that has facilities to help prepare them for life after high school. This entry was posted in 2012 bond, 21st century schools, Bilingual, District I - Elizabeth Santos, High Schools, New schools, Special events and tagged 2012 bond, Anna Eastman, BuildHISD, HISD Board President Anna Eastman, Sam Houston Math Science and Technology Center, Sam Houston MSTC, Sam Houston MSTC High School on March 24, 2017 by HISD Communications. Stakeholders of Sam Houston Math, Science, and Technology Center were briefed this week on initial design plans for the school’s new building. This entry was posted in 2012 bond, 21st century schools, District I - Elizabeth Santos, News and tagged 2012 bond, Anna Eastman, Sam Houston Math Science and Technology Center, Sam Houston MSTC on September 8, 2015 by HISD Communications. Three lucky HISD students got to see their names in lights on June 10, when hundreds of students from across the country were featured on a Times Square billboard in New York City. This entry was posted in College Readiness, District I - Elizabeth Santos, District VIII - Diana Dávila, High Schools and tagged Anna Eastman, Carnegie Vanguard High School, Graduate for Mas, Juliet Stipeche, Reagan High School on June 23, 2015 by HISD Communications. Meylin Ramirez just graduated with honors as a member of Reagan High School’s Class of 2015. But the journey behind that diploma is a testament to both her willpower and the strength of HISD’s support systems for students. This entry was posted in District I - Elizabeth Santos, High Schools and tagged Anna Eastman, communities in schools, Reagan High School on June 18, 2015 by HISD Communications. Two HISD high school juniors are well on their way to an education that straddles continents. On June 15, the Institute of International Education (IIE) bestowed Passport Awards on Luz De Leon of Davis High School and Karen Ortiz of Sharpstown International School. The Passport Awards were given to 13 students across the country in an effort to encourage these students to go abroad in college. This entry was posted in Achievement/Recognition, District I - Elizabeth Santos, District VI - Holly Maria Flynn Vilaseca, Global Education, High Schools and tagged Anna Eastman, Passport award, study abroad, Trustee Greg Meyers on June 18, 2015 by HISD Communications. What: Reagan High School will be hosting a ribbon-cutting ceremony on Wednesday to celebrate its recent International Baccalaureate authorization with students, parents and community members. Reagan received official authorization to operate as IB campus in July along with Hogg Middle School, creating the first continuous IB feeder pattern in the historic Heights neighborhood. Founded in 1968, IB is a non-profit foundation that offers challenging educational programs for students aged 3 to 19 to help develop their intellectual, personal, emotional, and social skills to live, learn and work in a rapidly globalizing world. When: Wednesday, Nov. 13, 2013 at 6 p.m. This entry was posted in Achievement/Recognition, High Schools, Special events and tagged Anna Eastman, Connie Berger, HISD, HISD Board of Trustees, HISD Board President Anna Eastman, Houston ISD, IB International Baccalaureate, International Baccalaureate, Reagan High School on November 12, 2013 by HISD Communications. Incumbent Trustees Anna Eastman and Harvin Moore will keep their seats on the Houston Independent School District Board of Education after beating their challengers, according to final, but unofficial results of Tuesday’s election. Former City Councilwoman Wanda Adams also won a seat on the HISD Board of Education, beating out two opponents to fill the District IX spot being vacated by departing Trustee Larry Marshall. Trustees Greg Meyers and Michael Lunceford were unopposed in their re-election bids. This entry was posted in Board of Education and tagged Anna Eastman, Davis HS, Harvin Moore, Kashmere HS, Reagan HS, Travis ES, Wanda Adams on November 6, 2013 by HISD Communications. What: HISD, the Independent Petroleum Association of America (IPAA), and Houston energy executives will gather to officially open the district’s new Energy Institute High School. The school is the first of its kind in the nation and represents a collaborative effort between a public school district and industry leaders. The high school will provide students with a rigorous STEM (science, technology, engineering, and math) curriculum, hands-on learning, and externships in the fields of geoscience, alternative energy, and offshore technology. This entry was posted in High Schools, Magnet/School Choice, New schools and tagged Anna Eastman, Energy Institute High School, Exxon Mobil, IPAA, STEM on August 13, 2013 by HISD Communications. 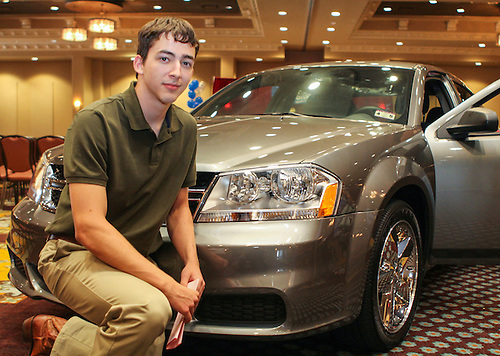 Bellaire High School graduate Kevin Dwyer, who caught a ride with his friend to the event, left the third Annual Cool to Be Smart celebration on Sunday in a brand new 2013 Dodge Avenger donated by the HISD Foundation and Helfman River Oaks Chrysler Jeep Dodge Ram. This entry was posted in Special events and tagged Anna Eastman, Cool to be smart, high school graduates, HISD, Houston ISD, Terry Grier on August 4, 2013 by HISD Communications.